Left and Write: D is for : Due South! D is for : Due South! The 90s, were an odd time in television history. It was right before the "reality show" craze, but during a time when "political correctness" began inching its way into our daily lives. Back then, the networks were still trying new and original stuff and, for my money, a little show called Due South was one of the best. Starring Canadian actor Paul Gross and David Marciano, Due South told the tale of RCMP Constable Benton Frasier and how he came down from the Great White North in search of his father's killer. This show fell into the "dramedy" category due to it being, mainly, a cop drama but it also had little bits of comedy sprinkled in the mix. "Well, you see, I used to live in the Yukon but I uncovered a plot that involved drowning caribou and then some men who were dressed in white came after me with homicidal intentions. It's a rather long story and it takes exactly two hours to tell, but the upshot of it is I was sent here. I think I embarrassed some people in the government." Gross and Marciano had great chemistry as two, total, polar opposites who became best of friends as they solved crimes together. Not only were the leads great, they had an awesome supporting cast, as well, including Diefenbaker....Frasier's pet wolf. Yes, he was a deaf wolf. That's just the sort of show this was. While Vecchio was a no nonsense, street detective with the attitude of "Do unto others before they do unto you", Frasier always put others first and embodied the stereotypes of the polite Canadian and the resourceful Royal Canadian Mounted Police officer. It's been said that, at first, the RCMP wouldn't endorse the show as they didn't want someone playing the corp as a buffoon but, after seeing the pilot, they did a 180 and became consultants to the show. The first two season featured Gross and Marciano. The third season, Marciano left and Callum Keith Rennie took the role of "Ray Vecchio". Not as a replacement, but the story was the the "real" Ray Vecchio had to go deep undercover with the mob, so the "fake" Ray Vecchio (the character's real name being Stanley Kowalski) was there to make sure Ray wasn't missed. To be honest, in my opinion, when Marciano left the show it lost a vital party of the dynamic that made it the funny, quirky, well written show it had become in the first two season. It might be pretty apparent by now, but I could go on and on (and on) about this show. I'll spare you my ramblings, though, and just end this post by saying that, in all my years of watching t.v., I've never quite seen the likes of Due South, before or after it. Honorable Mentions: The Dukes of Hazard, Darkwing Duck, Dark Shadows. Tune in tomorrow for a blast from the Saturday morning past. It'll be Dyna-riffic! I remember the show although I didn't watch it. A deaf wolf who read lips? Now that is original. I NEVER in my life heard of this show. How crazy! I love wolves though, or anything involving them. I wonder how I missed this. I remember the show, but don't think I every watched an episode. Sounds like something I would like. I related to funny and quirky. All in all, the 1990s was a strange decade for me. I am not saying I didn't watch ANYTHING on TV, because I did. I just didn't commit to very many shows in that entire decade. The early part of the decade I was living in NYC. Who had time? Then, I moved to GA and I had time... but I was reading a lot then. And then to MI and I watched some TV. And then to parents (who were divorced) so I was half the week one place, half the other. Made it difficult to watch ANYTHING. And then back to GA, where life settled down somewhat and I probably committed to more prime time TV than the last eight years. I know it was during this time that I watched The Highlander every day on USA at 6:00pm. But the first eight years of the 90s... extremely hit and miss. I have never heard of this show. I would have liked to see a few episodes. I never watched this show but if I had known about the wolf pet I would have. Sorry I missed it! Hi Mark - I definitely saw some of these shows - no idea why in the 1990s .. but I guess they were light relief .. I was not addicted! I hadn't realised the 'wolf' was deaf though .. but he was a lovely dog and obviously so clever! I don't know how I missed this one, other than because I was working an evening shift and didn't get home each night until 11:30 p.m., which coincided with STNG episodes. I think you and I might have watched tv together. You seem to like all shows I did. Due South was also one of my favorites. I even have the soundtrack. I also remember the show but never had the chance to catch it. Sounds like I missed out on a good one. I LOVE this show. My entire family LOVES this show. We quote the plane crash episode a lot. In fact, I think I might go watch it now. @jaybird: What?? You've never heard of it? It was on CBS, I believe, so if you don't watch a lot of network shows you could have missed it. @Sydney: Heh, yeah, "quirky" doesn't even begin to describe it. @Rachna: I think you might be able to get the dvds for cheap. Not sure if it's on Netflix, though. @Hilary: Oh yes, a very clever animal for sure. @Lynda: I think it was also moved around on the prime-time schedule a few times, so it wasn't hard to miss, I'm assuming. @Al: I always knew you had excellent taste! I have the soundtrack too and played the heck out of it! @Cathrina: It was a fun one, for sure. I never watched Due South but now I wished I had. I did watch the Dukes of Hazard on occasion. It brings back memories! That was a fun show. I totally missed this one. I think I have never heard of this show but, then, the 90s and TV and me really didn't work out much. It does make me think of Brisco County, Jr, though, which was one of the best TV shows ever. The early nineties had me in college...only watching what my rabbit ears could pick up. Ah, the good old days! Sounds like it would have been right up my alley. Darn it..... 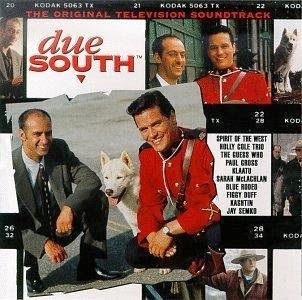 I never saw Due South and it sounds like the type of show I would enjoy. Now my favorites are NCIS, Blue Bloods, Castle and the Mentalist. If we ever get Netflicks I will look up Due South. Thanks for stopping by my blog and saying hello. Happy A to Z posting. Hehehe! I loved this show. The wolf was the cherry on the cupcake for me. Very interesting. I watched that show and quite regularly, but I would never have thought about it again... ever. I got a kick of the wolf runing through the city streets and jumping in buildings to find the crooks. Oh my gosh, I love your theme. Just scrolled down your previous posts. I remember hearing about this show, but I never watched it. I was a MASSIVE Dark Shadows fan. New follower here. This is definitely a show of it's own kind. A deaf wolf reading lips, seriously? How do the people know what it is well...not hearing? I loved Due South, haven't seen it for so long. Thanks for bringing back some great memories!